Hello and Welcome to Fifer Middle School! I would like to introduce myself. My name is Charlene Bieber. I have been at Fifer since 2016, and am looking forward to meeting everyone and working with you to make this a happy, healthy, and successful school year. I can be reached by calling (302) 697-4982 or by emailing me at Charlene.bieber@cr.k12.de.us. 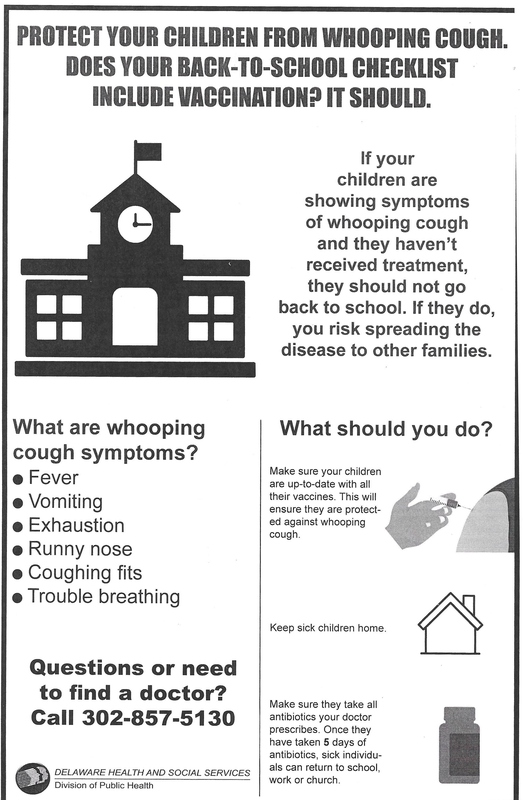 Whooping cough is a highly contagious disease transmitted by coughing or sneezing, or coming in direct contact with respiratory secretions of infected persons. The most common symptom is uncontrollable coughing spells often followed by a characteristic “whoop” sound. The disease can cause severe illness in infants and young children. The outbreak investigation began in June, 2018. Students attending Fifer Middle School who are new to Delaware Schools must have documentation of a physical (within the last 2 years), up-to-date immunizations, and TB screening (within the last 12 months) by the time the school year starts. All Medications will be kept in the nurse’s office. If a student needs to take medicine during school hours, parents/guardians need to bring the medication in its original container with dosage and directions on the label to the nurse’s office. A consent form will then need to be signed to administer the medication during the school day. Medications should be administered at home as much as possible to avoid students missing class time. All Fifer Middle School students will have an orthopedic screening done in the fall. This screening is done each year and assesses posture, curvature of the spine, and any abnormalities with walking. All 7th grade students will also have a vision and hearing screening. Parents/guardians will be notified with any concerns or findings from the screenings. Because germs can spread very easily in the school, if your child has a fever, diarrhea, or vomiting, please keep them home until they are symptom free for 24 hours. If you have any questions about whether your child should stay home from school please contact your primary health care provider.